The pace of technological advancement in the laptop consumer market is always high, leading to improvements in speed, user interface, and raw power. The competition is fierce, with new brands appearing on the scene every year, which is great for anyone looking to buy a laptop. Some brands have proven themselves over time, grabbing the lions share of the laptop market with sleek innovation (Apple), amazing stability (Toshiba), or advanced graphic and gaming abilities (Asus). 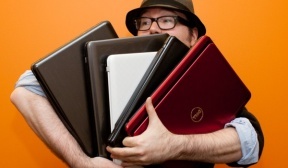 If you're currently hunting for a new laptop, take a look at this list of the top 10 laptop brands to consider. Dell Inc, set up by Michael Dell, comprises one of the largest technological corporations in the world in developing, repairing and selling of computers, laptops and other associated products. The company's acquisition of Perot Systems and Alienware has led to an expansion of its product line through the sale of data storage devices and personal computers. For those who are game for innovative products, Dell is an excellent choice. The company has successfully delivered innovative personal computers in the domains of supply chain management and electronic commerce catering to an array of customer specifications. This is perhaps the most dependable laptop brand. Founded in 1976 by Steve Jobs, Ronald Wayne and Steve Woznaik, Apple has attained the status of the largest and most admired laptop manufacturers across the globe. Armed with updated technological features and innovative designs, Apple’s unparalleled performance has made it a much sought after brand in the market. The notebooks are sleek, slim and offer portability with convenience owing to the light weight. The two most popular products are Macbook Air and Macbook Pro. With the launch of iMac in the year 1998, Apple became a pioneer in laptop innovation.